17 days till the Wonder Festival! The GSC offices have gotten a lot busier with the event closing in. 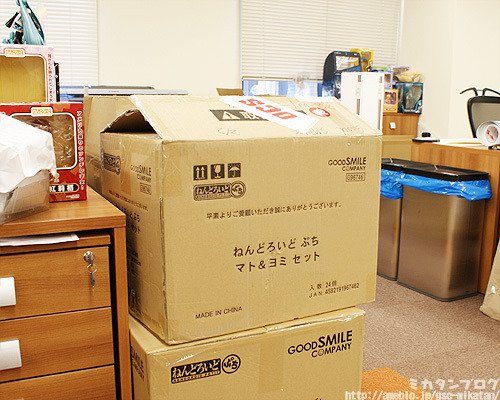 But that also means samples of the WonFes products are starting to arrive! If you haven’t had a chance to look at them, take a look at the page below! Today we’ll be starting the WonFes figure reviews with this cute pair! Nendoroid Petite: Mato & Yomi Set! The two girls are Mato Kuroi and Yomi Takanashi from Black Rock Shooter. These two don’t come with any optional parts, but there is a base for them hidden at the bottom there. I’ll go into more detail about the base a little later. Mato Kuroi and Yomi Takanashi! Takanashi’s name is very clever in Japanese – the kanji for her name mean ‘Small’, ‘ Bird’ and Playing’. But ‘Takanashi’ also means ‘No hawk’, because small birds will only play where there is no hawk around! 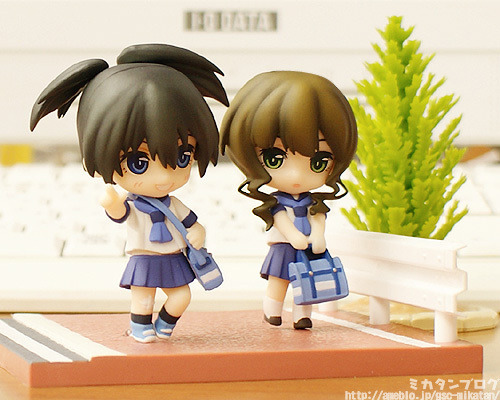 The energetic Mato and the refined Yomi both manage to keep their personalities and look adorable in Nendo form! That little gap that let’s you see Mato’s waist is priceless!! 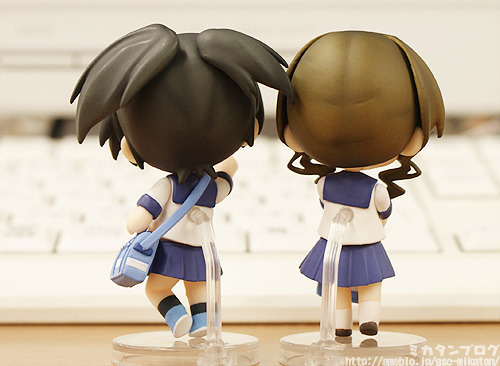 They use the usual stands for Nendoroid Petites with a prong to push into their backs. Mato’s twintails are fitted on an axis so you can move them up and down! It’s so cute! A special diorama base for the girls! If you choose to display them on this base it’ll make them look as if they are walking to school together! The poses are based on this illustration! It’s a really stunning scene that really captures the two of them nicely! It’s impressive how similar the figures are to the illustration! 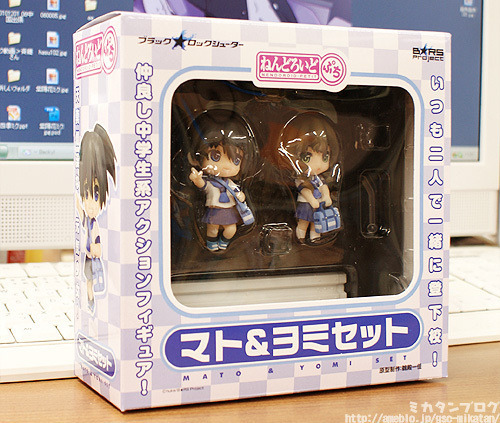 Displayed with Nendoroid Petite: BRS Set! 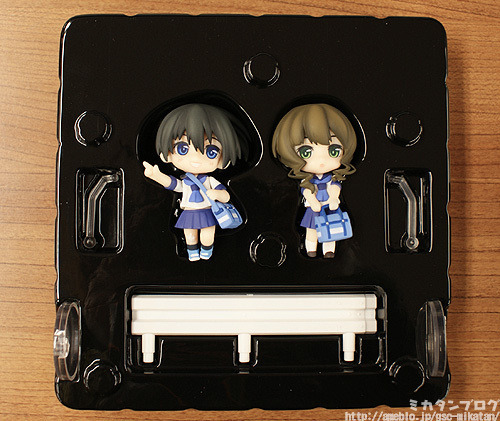 These two were extras with the BLACK★ROCK SHOOTER Blu-ray & DVD Set (Limited Edition). The two bases are both the exact same size so they look really nice together! You can put other expressions on them! Let’s change her into Miku! For those of you who are too lazy to exchange the expressions, you can take the easy way out and just exchange heads entirely! 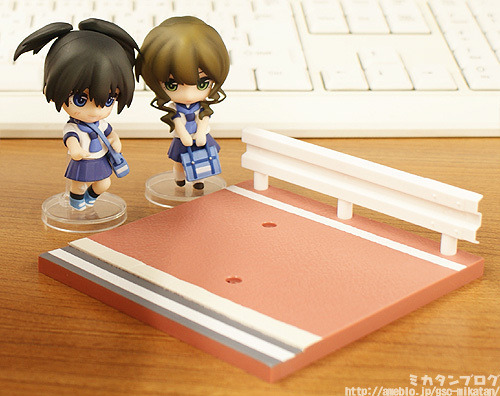 If you have a lot of Nendo Petites then there are so many weird and wonderful combinations you can make! Nendoroid Mato & Yomi Set! It’ll be on sale for just ¥1500! There are two ways to get your hands on them! They will be sold using numbered tickets at the event on the 6th February! More details will be available on the ‘Event Sales Page’ which will be available soon. (C)Crypton Future Media, Inc. ALL RIGHTS RESERVED.